Find My Workspace lists over 95% of the executive office suites market in Fairfield. Simply click Request Quote to check pricing for one office, or Add to Basket for multiple offices. 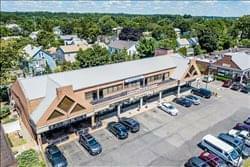 This center located in Connecticut is conveniently minutes from both the Merritt Parkway and I-95. Additionally, the Plaza is 1.5 miles from the Fairfield Train Station in town and the Fairfield Metro Station. With plenty of parking and dining options on-site, this is the perfect location for individual and small team offices. The amenities included are furnished office space, flexible terms, kitchen, meeting rooms, on-site management team and conference facilities.